The decision to publish the book has been very difficult, and taken with heavy hearts... My reason for writing it is simple: to give an account of the truth... Writing this memoir has entailed recording some very personal, intimate and emotional aspects of our lives. Sharing these with strangers does not come easily to me, but if I hadn't done so I would not have felt the book gave as full a picture as it is possible for me to give. I was going in this book with my mind already made up, but this book did little to convince me otherwise. it's just an account of what happened, excuses and thank yous and nothing to even slightly admit they might have done things a bit wrong (leaving kids alone with plenty of other options within budget). Aside from the famous passage mentioning your child's privates, this book slightly sympathies with the lucid abductor (no evidence?) and says more stern words about the police of another country. It's just odd. Plain odd. 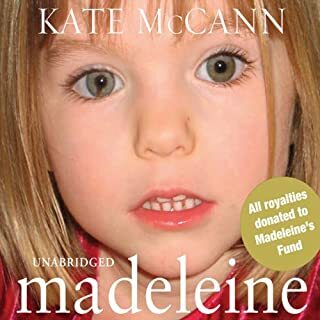 Aside from that, it's not too good of a book and we learn nothing about Madeline (it's like she did not exist before this tragedy), nothing. Just what she wore on the holiday, and a few (FEW) other bits. It should not be called 'Madeline'. It's a very self indulgent thing to publish such a book. Everyone else is to blame.